On December 6, 2016, Klay Tho mpson of the Golden State Warriors scored 60 points in just 3 quarters of a game against the Indiana Pacers. It was an amazing performance, and you can see the highlights over at ESPN, but that wasn’t the only performance of the night. You see, Klay only played in the first 3 quarters because his coach, Steve Kerr, benched him for the final quarter of the game. Why would you bench a player for scoring 60 points in 3 quarters? Klay was having the game of his career and setting records, so why would you sit him? Well, if you know anything about Steve Kerr, you would know that he has consistently stressed to his team that the only way to win, is to win as a team. He has told them repeatedly that no one player is bigger than the team. This is a group made up of All Stars, and he is telling them that they are no bigger than the team? He must be crazy! Well, he is not crazy. He is a smart coach and knows the power of teamwork and will do anything to impart his teaching on the Warriors, even if that means sitting Klay Thompson after he put on the performance of his life. This type of coaching was on national television for everyone to see and yet, most of the news media will only focus on Klay’s accomplishments and not Kerr’s. If you have been practicing Agile software development, you know that it too encourages the Team. Scrum, talks about self-organizing team’s as a critical factor in it’s success, but unfortunately, no one is watching a Scrum team on national television. Do you think you could sit your “Klay Thompson” in the 4th quarter? If not, what is that saying to your team? To your company? Are you prepared to rely on the individual contributor knowing that you may alienate others on the team? Have you looked at what could really be accomplished if you let the team figure things out and self-organize and you sat your “Klay Thompson”? I challenge you to pause for a moment and think about your own situation and look at how you manage your teams. 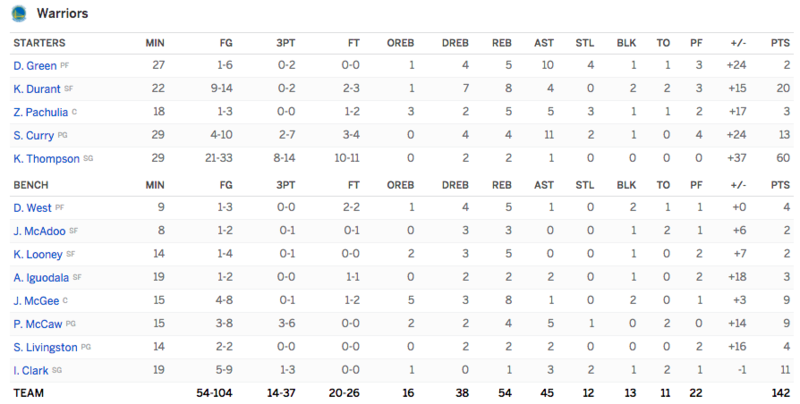 Note: The Warriors won the game, 142-106, and while you may look to the box score and see Klay’s 60, you will also see another amazing feat: Every single player on the team scored!